If you are looking for the most successful PADI IDC, Instructor Development Course, in Tenerife, Canary Islands, you have found it! In 2016 we were the only PADI Instructor Development Centre to run a course for every IE. Some other Dive Centres either cancelled their courses, as there was not enough candidates to fly a Course Director in or do not actually carry out the training, but just pass you on to someone else to train. Our Team, includes the only resident Platinum Course Director, PADI Master Instructor’s and Staff Instructor’s that offer a relaxed and friendly environment for you to complete your PADI Open Water Scuba Instructor Course (OWSI). The Instructor you complete your Pre-IDC with, will see your training through, right to the very end of the IE. Our dedicated Instructor training team is headed up by David Taylor, the only resident PADI Platinum Course Director who has had many years achieving a 100% pass rate for our Instructor candidates. Originally from Scotland, David has been on the island of Tenerife for many years running Dive Centres and training courses at all levels and is well known to the PADI Examiners. Also on permanent Staff are a PADI Master Instructor and PADI Staff Instructor with many many years of experience to help you though your course. The IDC’s can be run in English, Spanish, Dutch and other languages on request. The PADI IDC’s are held in Tenerife four times per year together with the Emergency First Response Instructor course. After you have completed the PADI IDC the PADI Instructor Exam is held right here on the island. It is possible to complete the theory part of your PADI Instructor Development Course via the PADI eLearning option provided by PADI. Even though with this route you have completed the theory element we highly recommend you complete the entire IDC at our Dive Centre. EFRi Guide, Primary and Secondary Care, with binder. *Please contact us if you have trained with another organisation and wish to make the crossover to PADI, so that we can advise your entry level. All of the study materials that you need are conveniently packaged in the IDC crewpack. Most candidates prefer to use their own dive kit but if you do not wish to travel with yours we can rent it to you. Candidates should bring their own laptop computer to be able to make use of digital training materials. Notepads, pens calculator and highlighters should be brought with you. You should be familiar with everything that you learned in all your courses up to and including PADI Divemaster. It is important to go over all the material before you arrive. Revision of this material is not part of the IDC, but knowledge of this material is essential. If it has been more than 6 months since you completed your PADI Divemaster course or you are at all unsure about any of the theory please enrol for our IDC Preparation course. In order to complete Emergency First Response Instructor training you must have a current (less than 2 years old) EFR provider certification, including AED. For candidates who do not have a current EFR when can complete this prior to your IDC. You will need the EFR Primary and Secondary Care Instructor Guide (PADI ref 70149). This is available from us on request the before the course commences. The PADI Instructor Development Course (IDC) is made up of two parts – the PADI Assistant Instructor (AI) course and the PADI Open Water Scuba Instructor (OWSI) program. Most dive professionals complete the entire IDC and go on to attend an Instructor Examination (IE), which is the final step to earn a PADI Instructor certification. It is possible to just take this part of the course together with Part I of the Instructor Exam. Part II can be taken at a later date after gaining some hands on experience. As a PADI Assistant Instructor you may assume limited teaching responsibilities including the Snorkelling and Discover Scuba Experience programmes and Project Aware and Peak Performance Buoyancy Specialties, Confined Water training and Open Water training presentations. The academic and practical training in Part I of the IDC covers the above skills, which you will have prepared for before the start of the IDC by completing the relevant sections of Knowledge Development in the Guide to Teaching. Finally these skills and knowledge are tested in Part I of the Instructor Exam which includes Confined Water and Open Water teaching presentations, a written exam and a dive rescue skills assessment. You will also attend and participate in a number of other presentations including dive industry overview; PADIs general standards and procedures; the role of media and prescriptive teaching; legal responsibility and risk management; adaptive teaching; the PADI continuing education philosophy; diver retention programmes, how to teach the recreational dive planner and PADI courses from Scuba Diver to Divemaster plus Specialty courses and Master Scuba Diver. You must perform 20 dive skills and a facedown non-stop swim for 800 metres using mask, snorkel and fins. Your dive theory will be tested using a 5-part exam for which the minimum score is 75%. As a successful PADI Open Water Scuba Instructor, you will be able to teach the entire range of PADI programmes and courses from Discover Scuba to Divemaster together with Specialty courses in accordance with your training and experience. You will gain Instructor status for EFR – an internationally recognised certification in first aid and secondary care which is useful not just to divers but also to those responsible in many workplaces and in the home, which means that you can teach these skills to anyone. In this course you will learn how to structure learning, use performance-based training and understand your role as the instructor. Special techniques and considerations for administering first aid and secondary care to children are also covered, as is training in the use of AED equipment. First the PADI IE (Instructor Examinations) and then it is time to start the celebrations….. If all has gone well during the examination process, congratulations! PADI Instructor Specialties – Get ready to step up to the next level and gain more teaching experience. 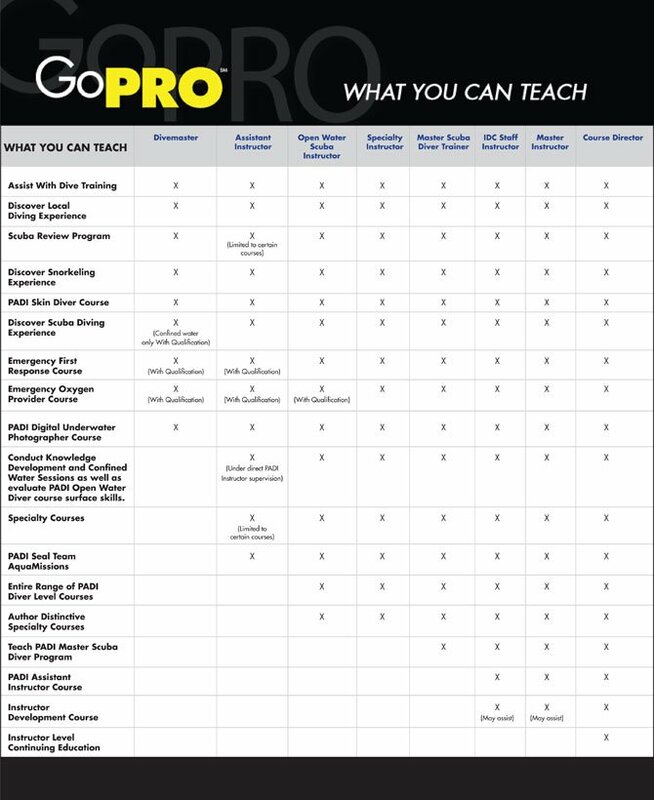 Our Team will train you on how to teach the PADI Specialties of your choice. Do you have even more time on your hands? Then you can join one of our Instructors and start teaching any courses that are booked with us from Scuba Diver to Rescue Diver and even PADI Divemaster. One of our Instructors will supervise, but the name on your students’ certification card will be yours! This experience will help you to quickly gain confidence and demonstrate to future employers that you have already put into practice what you learned on the IDC / IE. What happens if you do not pass? You can re-sit just the modules you failed if you do so within a year of the exam; you don’t have to do the whole IDC again. If you do not want to re-sit, then as long as you were successful at Part I you are qualified as a PADI Assistant Instructor and can upgrade to OWSI on any future IDC / IE.